A ramp track addition is necessary to be able to reach Sea Street on the waterfront. This track extends from the yard throat down to the level of the street. In order to make enough room for the two to three car spots along Sea Street, a bump out was built to accommodate the radius. A number of alternatives were considered but this seemed the most feasible. In the view above the American Can Company plant that was built on Sea Street is shown as it looks today. All other structures along the waterfront have either fallen or burnt down. The farthest extension of the track along this road would be adjacent to the side of this building. I am standing on the former R-O-W while taking the photo. In later years of my time period the Mearl Corporation owned the building and shipped a variety of marine products from this location. These products will be discussed at a later time. The road itself is gravel and the track was laid in it with only the tops of the rail showing. This allowed for driving along the street. The location was about a mile from the yard and somewhat lower in elevation. 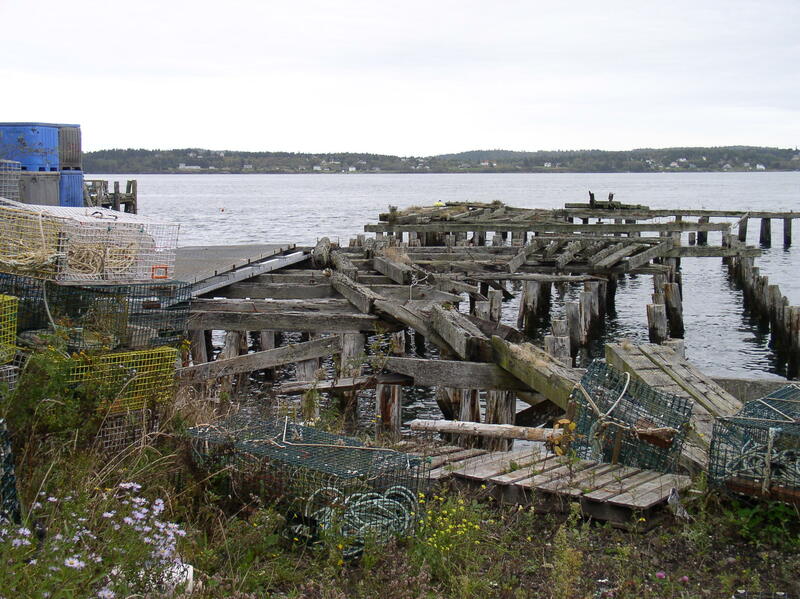 To illustrate, the above photo was taken about ten years ago and shows what was left of the railroad freight house wharf. The heavy angled timbers were the track supports. Today it is all gone. Progress has been made this week on the bench work for the Eastport peninsula. This has been the area of concentration. Similar to the previous areas, Eastport is also flat with one exception. One track will drop down grade from the yard to the harbor. This was also the case with the prototype. The yard was higher and about a mile form the harbor itself. I won’t have the luxury of having a scale mile to my harbor. Especially with O Scale, there is always compression to deal with. In the view shown, there are several things to note. First, note that Eastport gets wider as it gets closer to the camera. 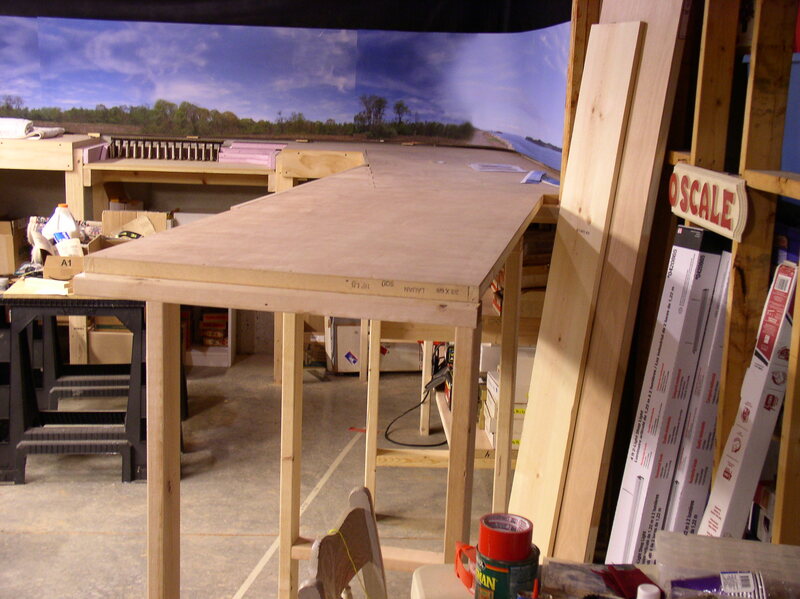 Starting near the sign that says ‘O Scale’, there is a 15″ wide aisle between the table surface and the stud wall. This is access to the other side of the yard. The two step down surfaces deal with the formation of the harbor. The surface closest to the camera will be the water surface. 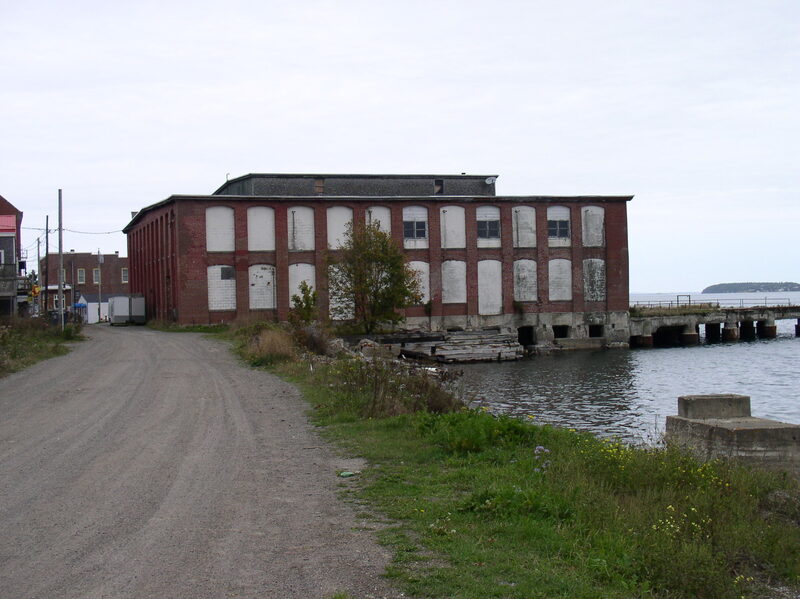 The next higher surface is Sea Street which is the gravel road along the edge of the harbor. The track is in the middle of this street and almost buried. This is just another view of the harbor area. 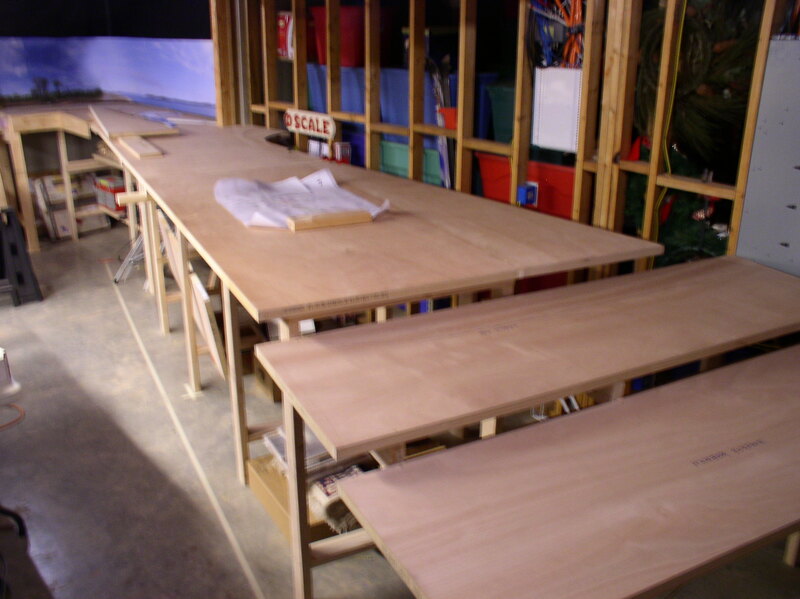 There will be a couple of piers that jut out into the water, but the major space will be utilized by a number of boat models that I have built for the purpose. I have a lot more work to do in strengthening the whole structure and trimming it out. At present I am working on building the support for the track that will come from the yard throat in the background and run along the left edge of the main platform, dropping all the way until it reaches the level of Sea Street. That bit of structure will start narrow and then widen at the end in order to accommodate the curve needed to enter Sea Street. If that description is not clear, hopefully the future photos will explain things. The last couple of days have netted the continuance of the bench work and backdrop from Ayers Junction to the beginning of Eastport Yard. The section next to Ayers Junction is the Pennamaquan River crossing. This calls for a lowered section in the bench work to accommodate the low trestle that will be needed. The trestle is done. It is being weathered. Photos will follow its completion. 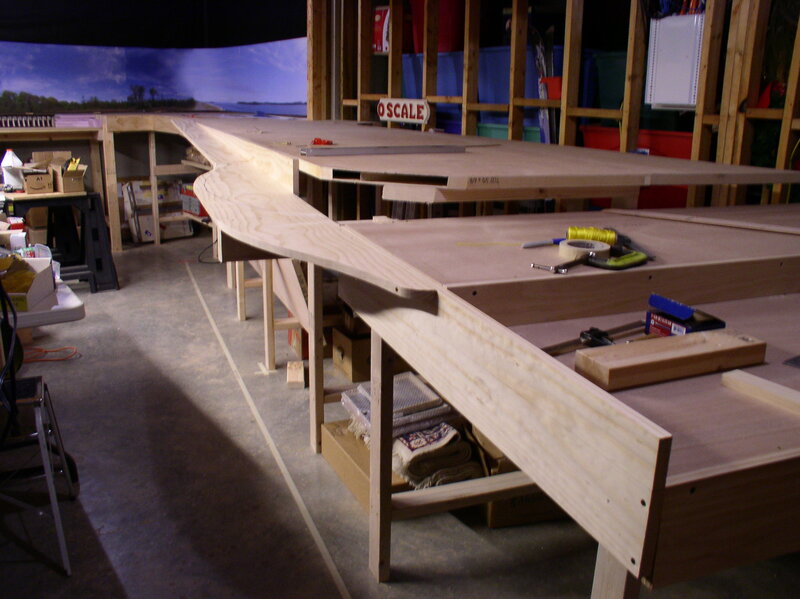 After the river area, the bench work turns along the wall to allow the curve into Eastport. 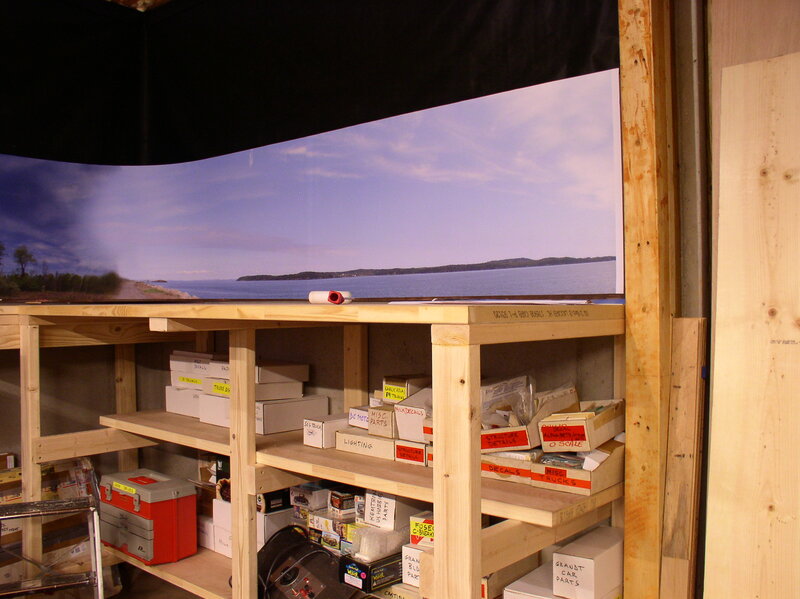 Note in the photo that there is a transition from the wooded area to a right of way along Passamaquoddy Bay. Although far shorter than the actual location, at least I got some of the spectacular ocean view worked in. If nothing else, it helps me to remember how beautiful that section is. The darkened sky image will have to be airbrushed to lighten the area and blend the clouds better. I need to hear from Dave Burgess, who did the backdrops, about what would be safe to spray on the vinyl material of the backdrop itself. From the ocean view, the bench work will angle into the main space and form a peninsula that will have a right angle section at the end. 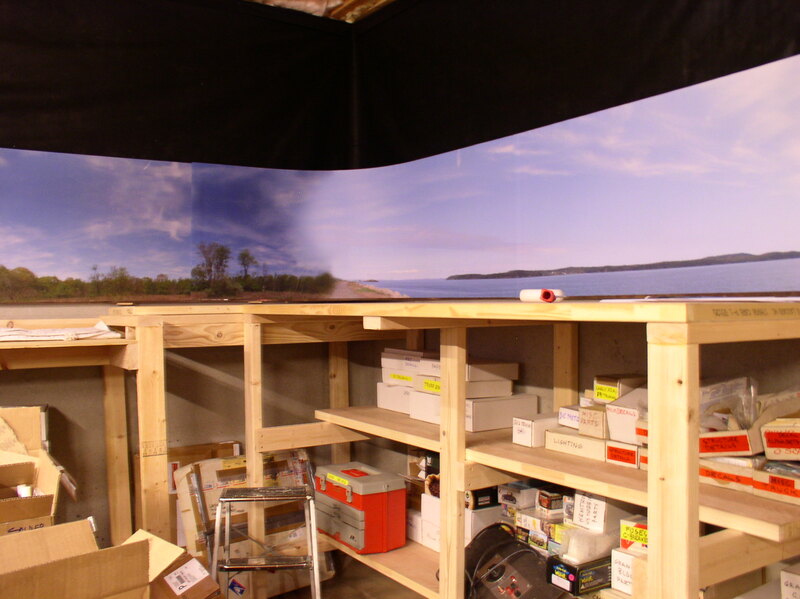 This final section will encompass the harbor scene which in reality was about a mile downhill from the yard itself. That will entail some more compromise to fit is all in and still resemble Eastport. But, being the large scale that O is, compromise is often a regular feature. 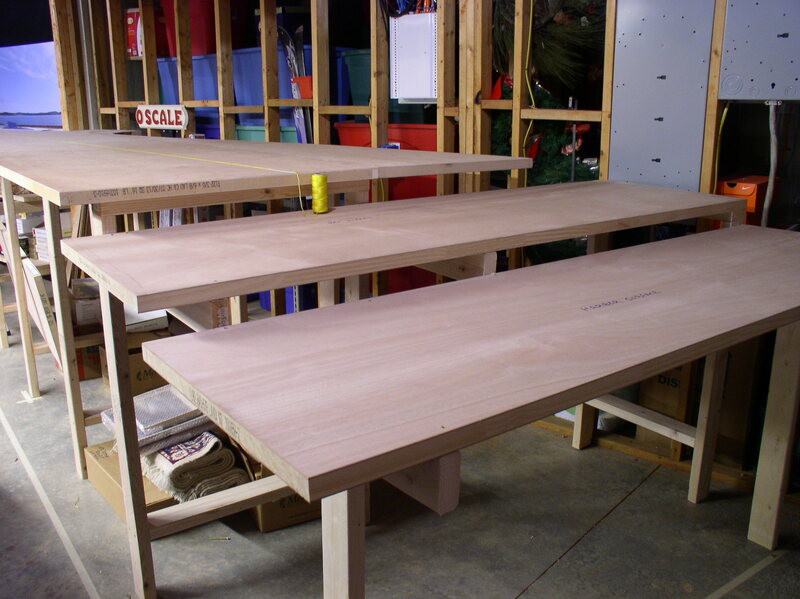 The nearest corner of the bench facing the camera will be hidden as the next section of bench top will be notched to fit around it and allow for an angle departure from the wall. It appears that due to the width of Eastport Yard, there will be no backdrop in that section. There are two choices. 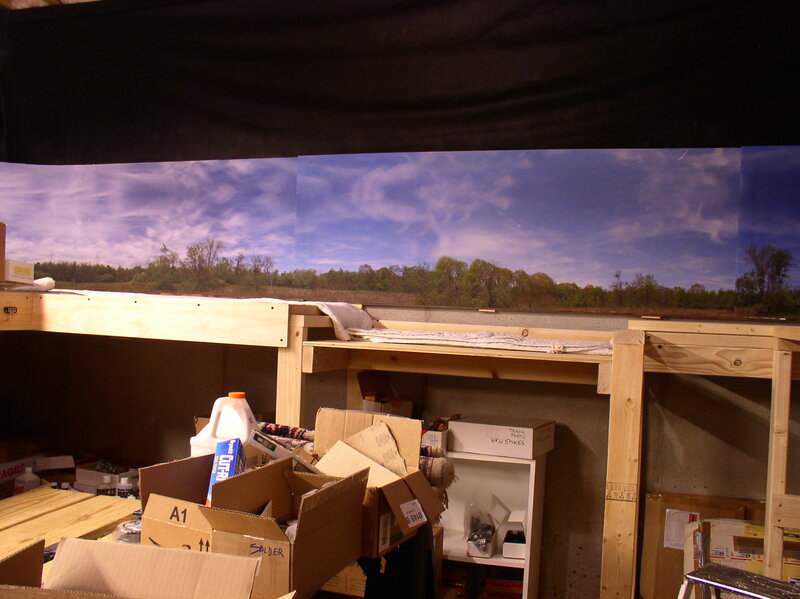 either just nothing, or hang a black cloth similar to what is shown above the photo backdrop. 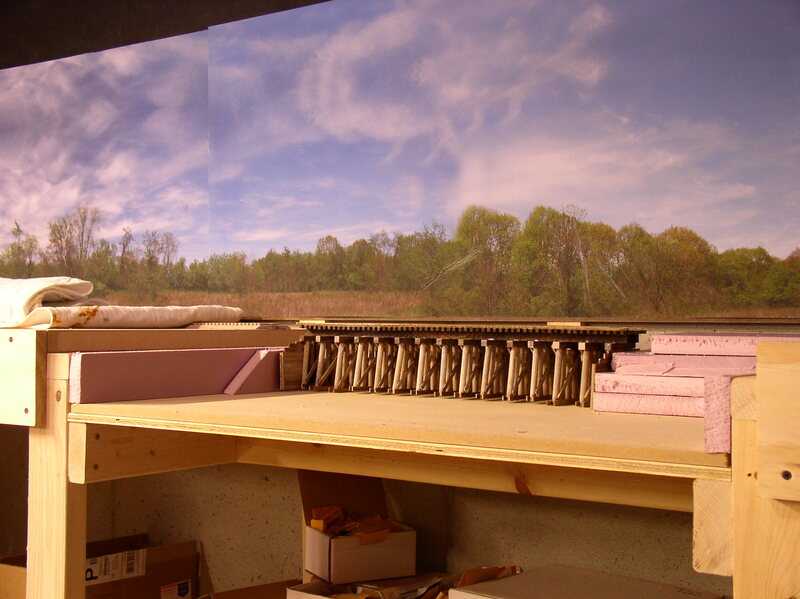 This is an idea that Trevor Marshall used on his S Scale railroad and I am leaning toward borrowing the idea. With the cloth, the ugly area beyond the railroad is no longer visible, but in case of need, it can be just pushed aside. I also completed the wiring of Ayers Junction. It was good to get back to work. I noted yesterday that it has been almost a month since I last updated the blog. Work on the railroad has fallen to the sporadic level. This is primarily due to travel first to the National Convention in Indianapolis, and then onto the middle of Michigan to spend time with our oldest daughter. The travel took a large chunk of time away from home time. I did however find a few supplies at the convention that I needed, and I continued to sell a few leftovers from the former railroad to help finance my ongoing work. However, we are back home on a regular schedule once again armed with fresh supplies and renewed vigor. 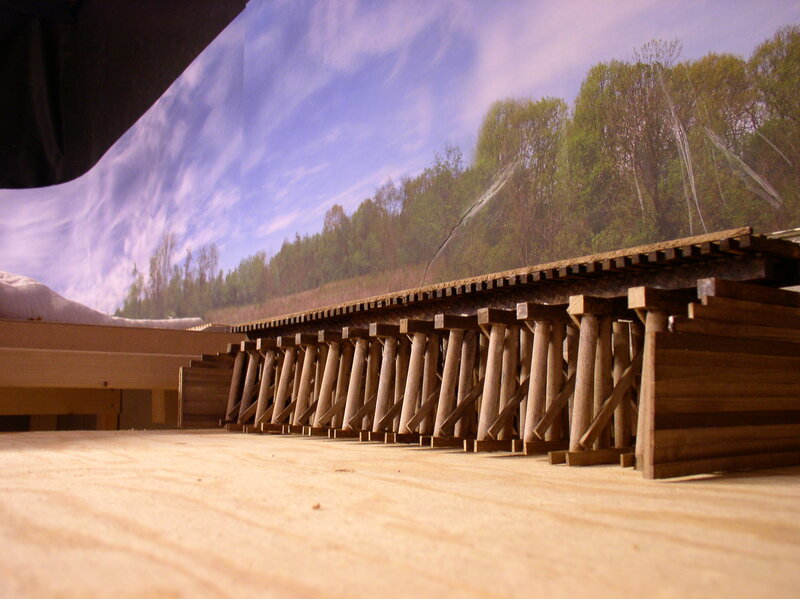 Next on the horizon is the completion of the backdrop from Ayers to Eastport and the bench work as far as the Eastport yard throat, plus the installation of the trestle across the Pennamaquan River. Hopefully, I’ll have a few photos to share next time around.